Thought 2D was dead? SNK Playmore has other ideas. 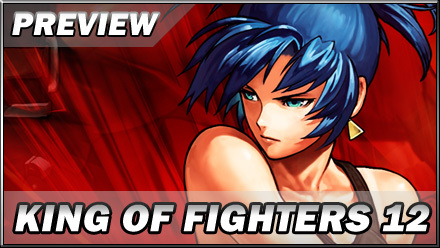 Kikizo trades punches with the new King of Fighters. 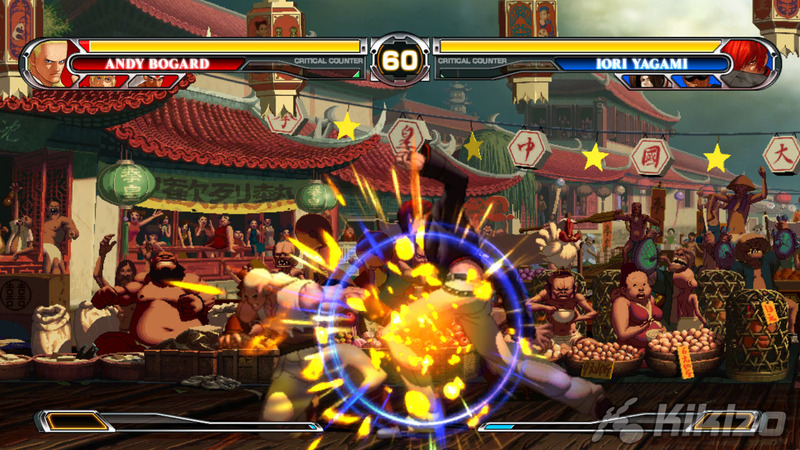 There's a simple way of working out whether you should be looking forward to The King of Fighters XII. Consider the following trailer. If you see a lot of deeply suspicious, long-haired J-Pop junkies garbed in leotards of gaudily retrogressive 2D, windmilling into each other with combination kicks as old as Mario's overalls, then please quietly close this window, order a cheeseburger or other masculinity-affirming Western foodstuff and take a look at Red Dead Redemption. If, on the other hand, you see the late flowering of a franchise which epitomises the neglected but enduring 2D fighting genre, stripped of excess modes, moves, characters and cut scenes, honed right down to the bare necessities then built right back up into all-new, hand-crafted exquisiteness, then the hype train starts here. Where Capcom took the fully 3D route with Street Fighter IV, SNK Playmore has given its celebrated but arthritic roster of sprites a complete revamp, producing bigger, better animated, more detailed and vastly more expressive fighters to fill out modern high definition displays. Character drawings were modelled in 3D, then rendered back into 2D, giving the resulting sprites greater depth of motion, before being subjected to a year and a half of careful ornamentation, the developer's talented artists painting in every belt buckle, brow crease and sinew frame by frame. The amount of work this entailed necessitated cutting the line-up to 20 (less than half that of King of Fighters 2002), predominantly composed of characters from the first four games in the series, but only the most obstinate of Maxima fans will sneer at the results. 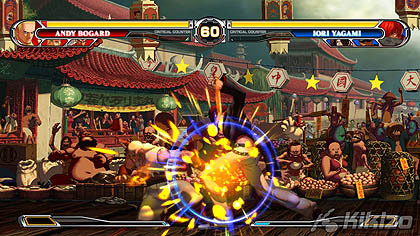 From the way Muay Thai boxer Joe Higashi bounces on his tiptoes to Ash Crimson's effete, hands-in-pockets insolence, the savage grin which appears on youthful Sie Kensou's face as he nails a throw to brooding Iori Yagami's clawed finger swipes, this is the bleeding (albeit pixellated) edge of 2D art. Stage backgrounds (there are seven in our preview copy) have seen a similar level of spit and polish, and are crammed with regional oddities, like a page from Where's Waldo brought to life. 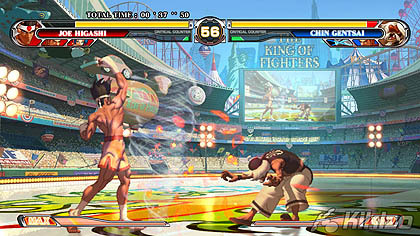 In the tournament arena, crowds throw tinsel and wave countless flags while a giant screen replicates the action in the distance. Fat women in summer dresses brandish baguettes at a French port (one waves a painted sign - "Faites Son Mieux"), and a skinny elder gobbles noodles next to a cheery panda merchant in the Chinese market stage. If my studiedly casual name-dropping a paragraph back had you scurrying for the game's Wikipedia page, don't worry - King of Fighters XII is entirely plot-less save for a few ending cut scenes, so there's no need to buff up on the franchise backstory. All you need to know about Ralf Jones, for instance, is that he's got some nasty button-mashing punch flurries and backbreaker throws, while Joe Higashi is a good beginner's choice with his blazing flying kicks and hurricane uppercut.